Many aspects of any public transportation project’s financial model can be applied to a PBS. The initial capital investment, operational costs, revenue potential, ROI, depreciation and other financial aspects of a PBS will depend greatly on the environment the PBS is operated in, decisions made by the governing body and the quality of service the PBS intends to deliver to the user. 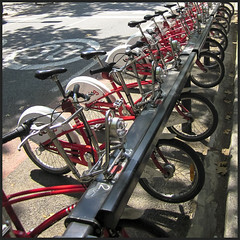 While some might argue that a PBS is too expensive, the reality is that, as public transportation projects go, a bicycle sharing system is relatively low in cost. The capital costs of a PBS are significantly overshadowed by those of other public transportation or urban development projects. In Western systems, a PBS can come in at less than 10 percent of the capital cost of road or light rail covering the same area. While capital costs are quite straightforward, it is easy to overestimate the revenue potential and to forget to take depreciation and recapitalization costs into consideration in the initial financial modeling. Many communities decide to package a PBS in a larger loan or earmark for public transportation or city beautification projects. This is because the relatively low cost of PBS compared with other transportation projects puts it under the radar of many funding mechanisms currently in place. Development banks, earmarks and other such mechanisms for funding infrastructure projects are often not designed for such small amounts. 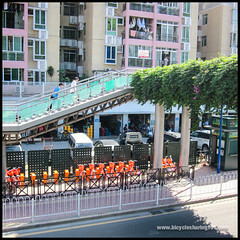 For example, in Guangzhou, China, the PBS was packaged with the larger BRT budget, of which it represented just 4.1% of the budget for the total NMT. 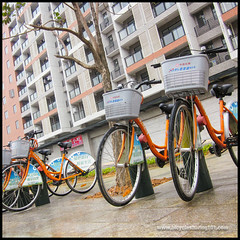 The photographs and figures below illustrate some of the aspects of the ‘Financial Model’ chapter in the book Bicycle Sharing 101: Getting the Wheels Turning. They are meant to be viewed in the context of reading that chapter. 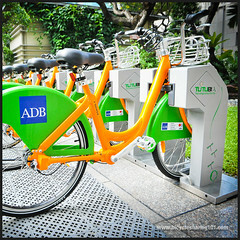 ABOVE: These stations and bikes in Montreal, Hangzhou and Copenhagen illustrate the significant advertising opportunities that a PBS offers. ABOVE: The sponsorship deal that put the Barclays logo and name to London’s bike sharing system turned the spotlight onto this form of financing, with the likes of Citibank and MasterCard following suit in New York. ABOVE: The Chinese city of Yantai had its system sponsored by the China Foundation for Human Rights Development. 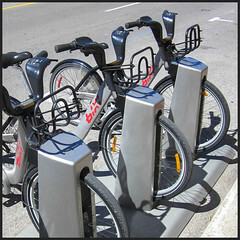 ABOVE: Capital Bikeshare has a range of branded shirts, caps, bags and other accessories, which it markets prominently on its website, presumably both for the revenue and to market the brand’s “trendy” or “retro” factors. 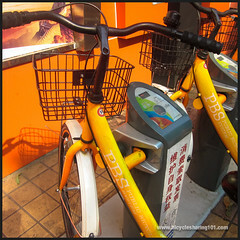 ABOVE: In Wuhan, China, the kiosks offer drinks, newspapers and even recharging services for electric bicycles and scooters.